Do you experience challenges with the process of window cleaning around your house? Your struggles are not enough to remove stains, water streaks and grime from glass surfaces? The experts of window washing in Grange Park will help you out! Say goodbye to the endless hours of polishing and wiping – the skilled and experienced team will manage this matter. You will be able to make the most of your extra time – just let us do this time-consuming and tiresome work for you. Our professional approach will grant you lots of perks. We also provide our professional services in nearby areas: Winchmore Hill, Bowes Park, Southgate, Palmers Green, Osidge. With our skill and craftsmanship, the great look of your property will be noticeable immediately – the adepts of commercial window cleaning will deal with this matter. We employ water-fed extension pole system for fast and effective window washing, up to the fourth floor. For high-rise office buildings, we use up-to-date rope access methods. With our gear, we are prepared reach the highest glass panes, even on the the highest buildings London is so popular with. From small shops to towering business edifices, we ensure top-notch services – take advantage, now! You can count on the team - they are truly the specialists of window cleaning. They all have passed through diverse training sessions, so you can get top-notch help for all glass surfaces types. What we can polish includes: single, double, garden windows, bay or sash windows, French doors, patio doors, conservatories and skylights. Your building can freshened swiftly with our help. Call us every time you need great window cleaning for your house or office. We use the most progressive techniques to be sure that you receive second-to-none window cleaning. With our water-fed extension pole cleaning system and high pressure cleaning methods, you will enjoy crystal clear look of your windows. We attach our poles to water reservoirs in our vans to make sure that there is no risk for the exterior of your dwelling or business premise. For higher windows, we employ absolutely secured rope access approach. You can use the advantage of these cleaning methods now – just ring 020 3746 3113! 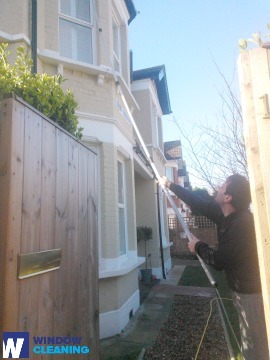 Book our prompt and reliable domestic window cleaning in Grange Park. We clean the windows of your property in and outside. The solutions we use are eco-friendly - you will love the superb end-results and make a green choice. In addition, we use only purified water. Don't wait, ring 020 3746 3113 and order our top-notch services. Our customer service agents will assist you – they are on-call 24/7. Another ways of booking – our request a cleaner online form or just chat with our operators.